Those who choose Mount Carmel College of Nursing don’t just see nursing as a job, but a way of life. Over the years, we’ve had the pleasure of personally getting to know many of our students and have had the opportunity to learn what motivated them pursue their passion for caring for others. Below are just a few stories of the wonderful, talented and dedicated people who have come through our doors. I’ve been taking care of my two autistic brothers my entire life, so caring for people just sort of comes naturally to me. Also, back in high school I was in a program called health technologies where I learned about being a nursing assistant. That class gave me the opportunity to visit nursing homes and hospitals to see what things were like in the real world. Watching how those nurses were able to not only care for their patient’s physical needs, but also make personal connections when they were most vulnerable just furthered my desire to pursue this as a career. Another thing driving me is that my whole family came here from Somalia and never had a chance to finish their college careers. Because of this, I took it upon myself to be the first in my family to get a degree. I’m now working at Mount Carmel East and am in my junior year at the college. I’m not sure exactly which area of nursing I want to go into, but Mount Carmel College of Nursing does a great job of exposing students to all of the career possibilities within the field. So far I feel confident about a lot of areas, but there's way more to learn, so I’ll probably go on to complete my masters degree here too. Then, I hope to travel to some of the more impoverished places in the world so I can provide care for those who need it most. With a mom and brother who are both nurses and having a father who works in law enforcement, I guess I just kind of grew up in a world of selflessness and caring about those around you. 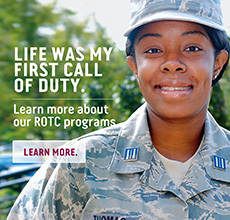 I’m originally from Lancaster, Ohio, but moved to Columbus to join ROTC at The O.S. University and to start the nursing program at Mount Carmel College of Nursing. I was originally drawn to this program because my brother graduated from here and always talked about how great the college was. The class sizes are more personal, so not only do you form better relationships with your peers, you also get a lot of face time with your professors. The other thing I found attractive was that it's strictly a college for nursing. So once you made it in your freshman year, you're in the nursing program. At other institutions you might get stuck on a waiting list. Plus, being connected to Mount Carmel Health System, you’re guaranteed to get clinicals and hands-on training. I’m currently in my senior year and am very much looking forward to the future. I’m very thankful that Mount Carmel College of Nursing is set up to not only help me be the best nurse I can be, but they’re also very accommodating of my military training. Without them I wouldn’t be able to pursue my dream of following in my family’s footsteps. I guess you could say I became a nurse by accident. The year was 1995 and I was on the way to the doctor for the flu. Being sick, I couldn’t sit up so I had to lay flat in the back of our van. On any other day, this probably wouldn’t have been a problem. But this wasn’t any other day. The impact from the car that hit us was so violent that it sent me flying, causing internal injuries that ultimately led to the removal of my spleen. My initial recovery went well, but over the next few years, I would often experience severe bouts of abdominal pain. Then one Easter morning, my suffering became so intense that I was rushed to the ER where they determined that part of my small intestine had to be removed. The average small intestine is 27 feet. I was now left with only 10 inches and would forever require the aid of a feeding tube for the rest of my life. I was 10 years old. As horrible as that car accident was, it actually proved to be a blessing in disguise. Being surrounded by great caregivers on a regular basis sparked a desire to do for others what so many had done for me. It was because of this experience that I discovered my true calling. It was because of those amazing people that I became a nurse. I had just started working on the oncology unit as a registered nurse at Mount Carmel West when I heard that my sister had been diagnosed with breast cancer. She was still back in our homeland of Cameroon and didn’t have access to quality healthcare. I knew I had to get her to the States. Although I hadn’t worked at Mount Carmel that long, one of our oncologists went out of his way to get her here for the treatment she desperately needed. It was seeing this kind of selflessness that inspired me to push myself to go above and beyond to reach my full potential. It was during this time that I enrolled in Mount Carmel College of Nursing’s Online RN-BSN Completion program. Although it was tough working a full time job and studying at the same time, the faculty members and instructors treated me with kindness and gave me encouragement every step of the way. From there I entered and completed their master’s program and am now a certified nurse practitioner. I am very grateful not only for the excellent education I received, but also the respect and support that was shown to me while reaching my goals. This is an accomplishment that I am very proud to be able to share with my sister. I knew nurses did amazing things every day, but I never truly realized to what extent until I got to see what they did first hand. A few years ago, my boyfriend’s little sister became very ill and started experiencing kidney failure. This of course led to an extended stay in the hospital while they tried to figure out what was wrong. When visiting her, I noticed how the nurses not only provided medical care, but emotional support. It was incredible how they were able to keep everyone’s spirits up during what was a very scary time. I was still in high school then, but seeing their passion inspired me to volunteer at our local hospital in the ICU. Now, a few semesters away from becoming a nurse myself, I’m just as amazed by the people who choose this profession and am blessed to be able to learn from people who continuously put the needs of others above their own. My high school boyfriend is now my husband. And I honestly believe that if it wasn’t for a few incredible nurses, I wouldn’t also have my sister in-law. An update on now MCCN alumna, Emily Sullivan, BSN, RN: She has landed her dream job in the Pediatric Intensive Care Unit at Nationwide Children’s Hospital! Says Emily, “Mount Carmel took me to the place I always wanted to be… the place where I first decided to be a nurse.” Way to go, Emily!